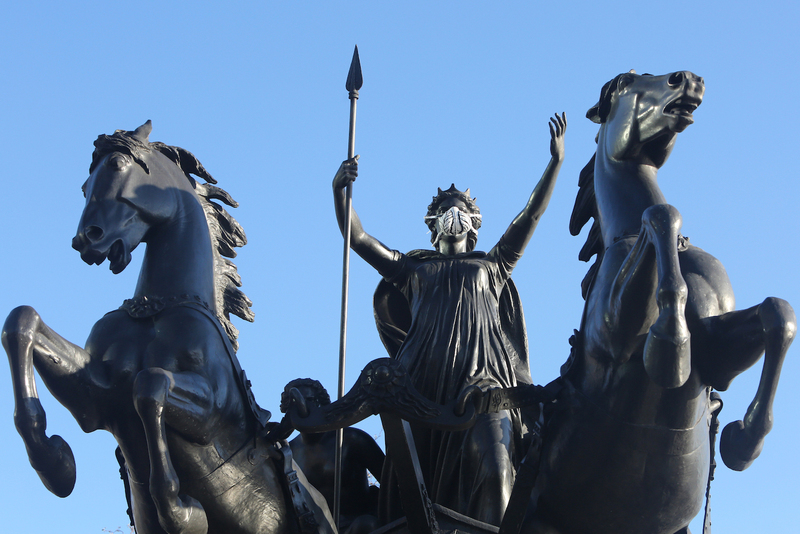 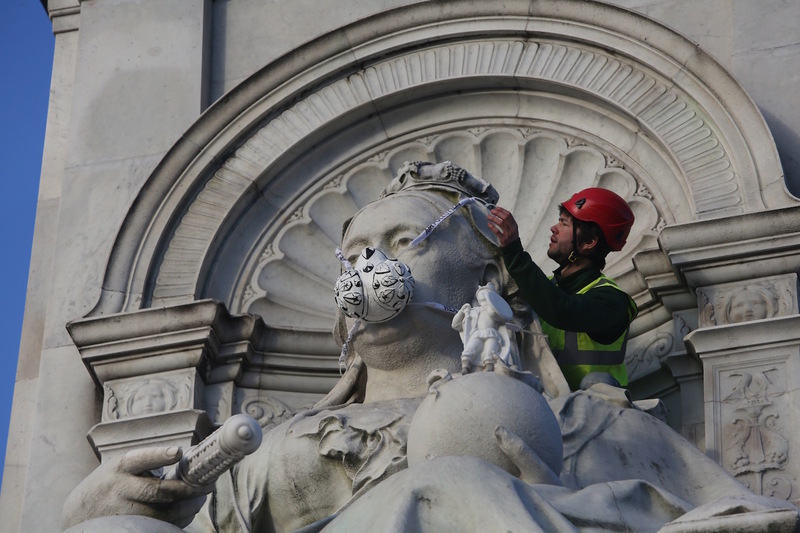 From Buckingham Palace’s white marble Queen Victoria to the famous aluminum Eros in Piccadilly Circus, high-profile statues of historical and mythical figures across London have become central participants in an air pollution protest. 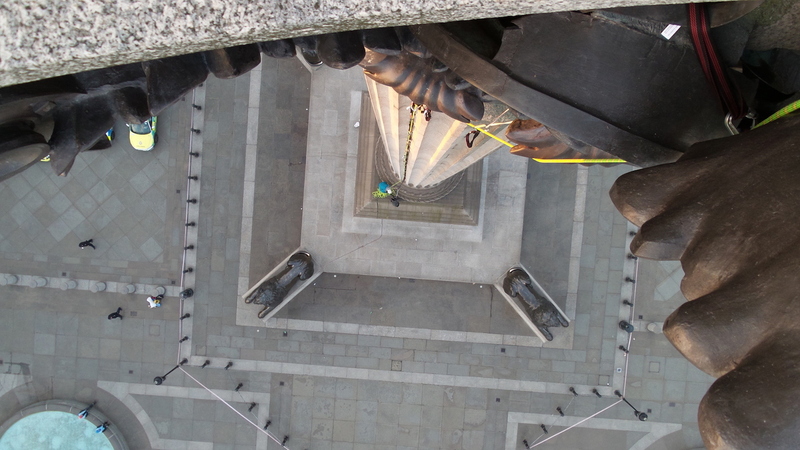 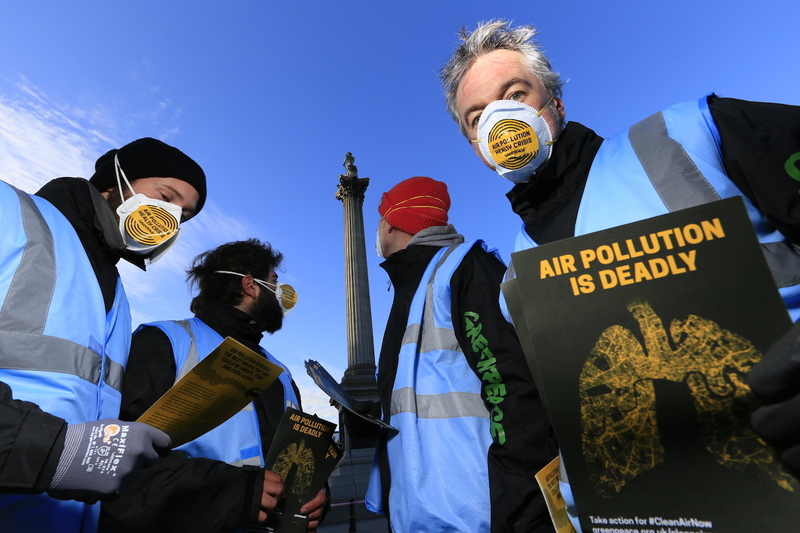 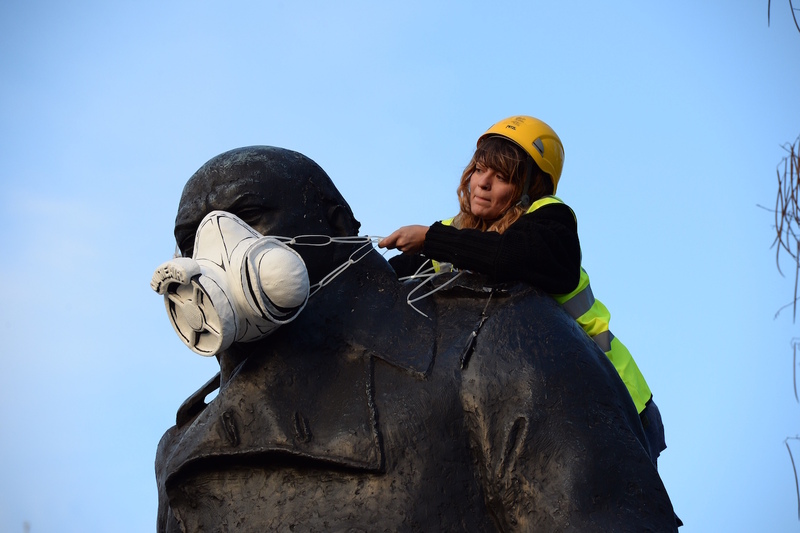 Before sunrise, Greenpeace activists wearing vests emblazoned with the words “Statue Cleaning Team” spread across the city and scaled 18 public sculptures, covering their faces with giant air pollution masks to make visible the issue of lethal levels of toxic air. 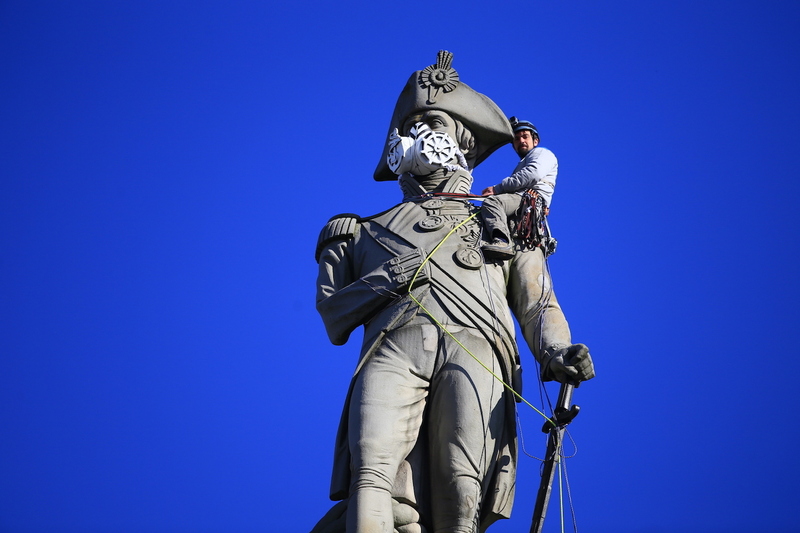 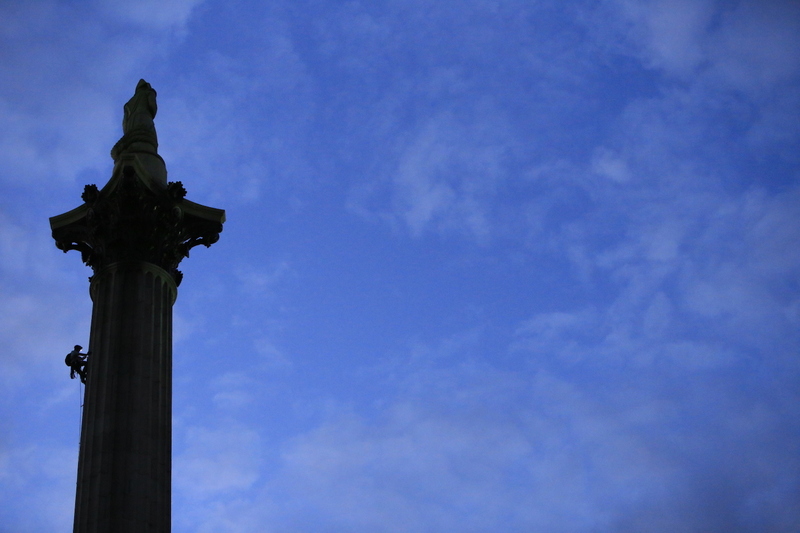 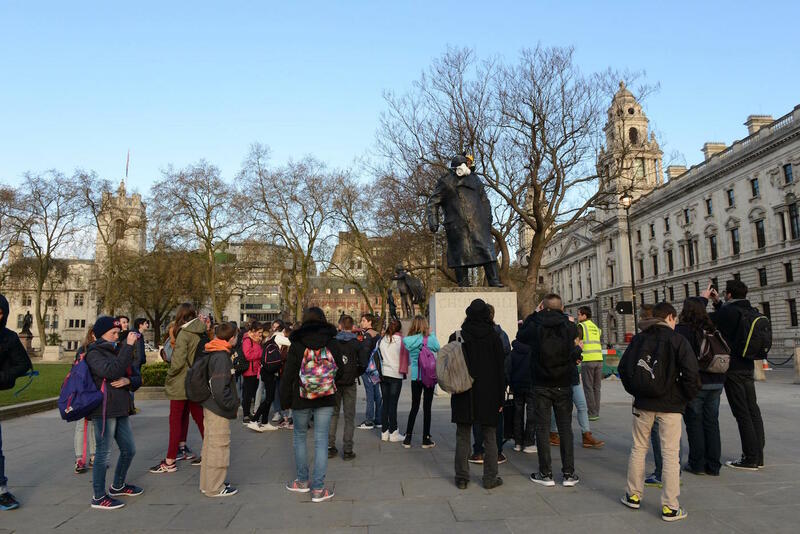 Other works involved include a bronze of Oliver Cromwell outside the House of Commons, the Winston Churchill on Parliament Square, the equestrian statue of the Duke of Wellington at Hyde Park Corner, and the 170-foot-tall column in Trafalgar Square commemorating Admiral Lord Nelson. 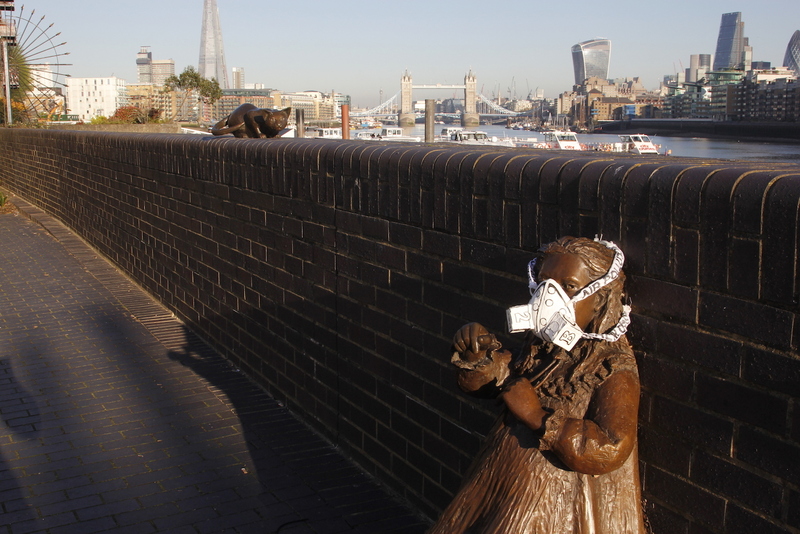 Artist Chris Kelly, who has previously collaborated with Greenpeace for other public actions, designed the line of wheat-based masks, customizing each one for its intended recipient. 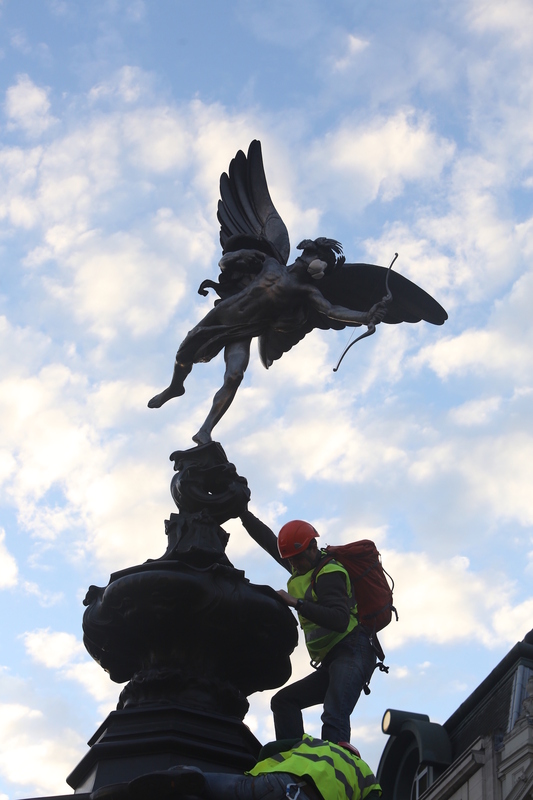 Eros’s had two hearts in the place of filtering canisters, for instance, while Churchill’s was adorned with a radio speaker and a bowler hat. 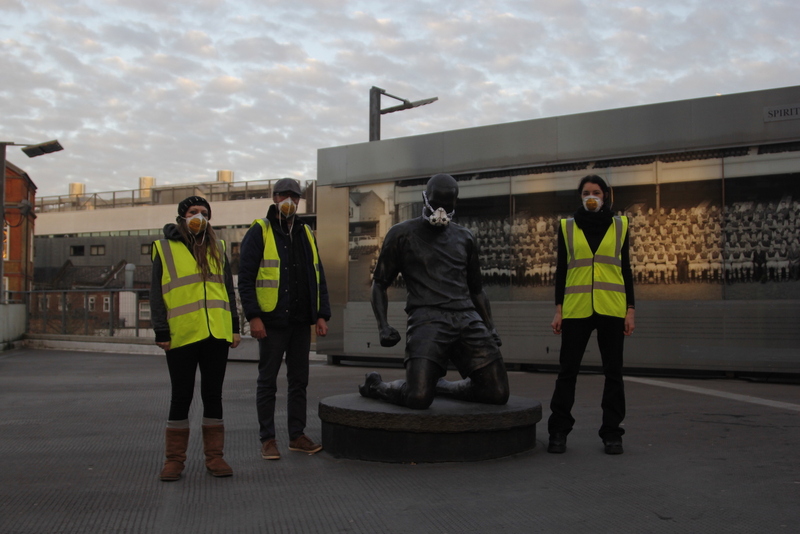 At Arsenal Football Club’s Emirates Stadium, a bronze Thierry Henry received a mask with two soccer balls; meanwhile, an anchor and a steering wheel embellished Lord Nelson’s. 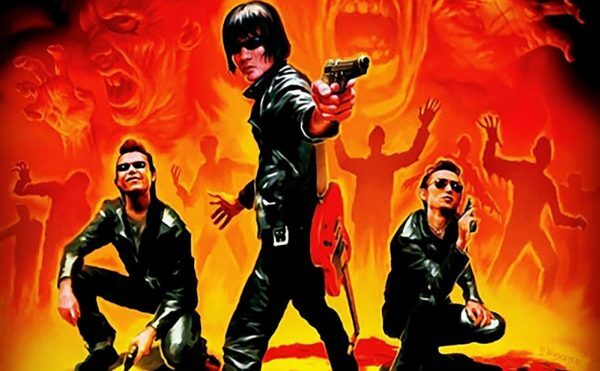 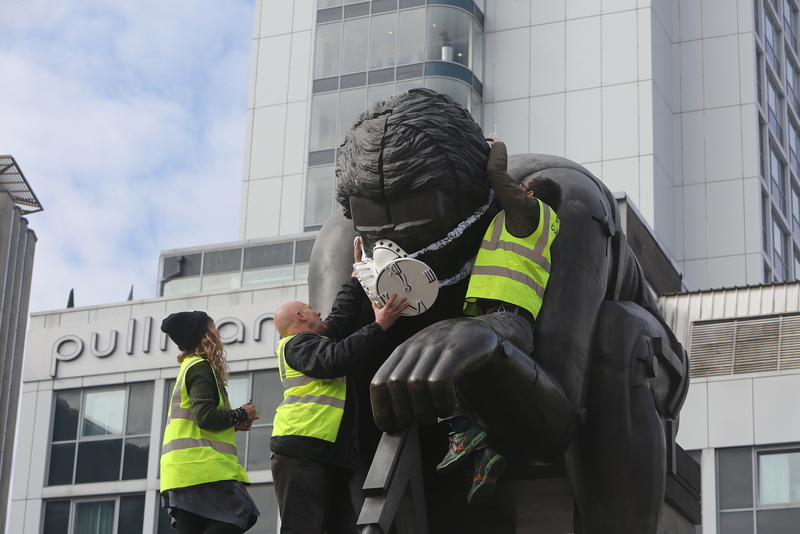 As the BBC reported, police have since arrested eight of the 30 activists involved for breaching security laws as well as for suspicion of criminal damage. 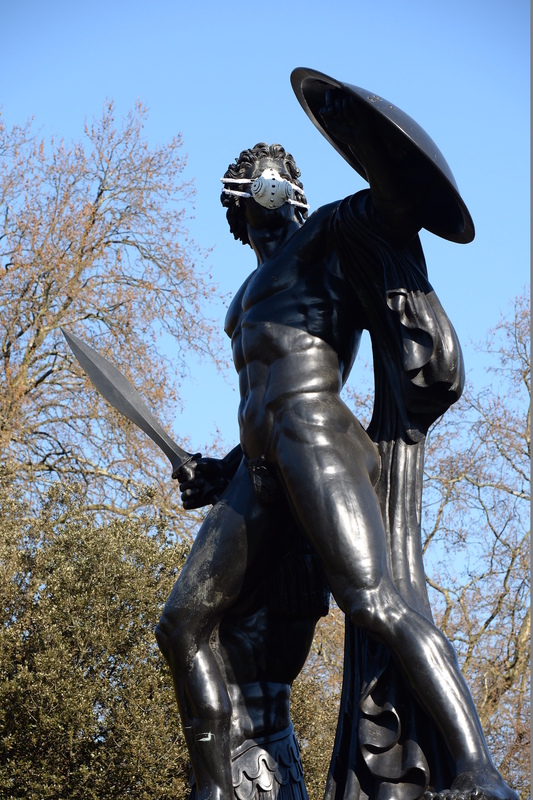 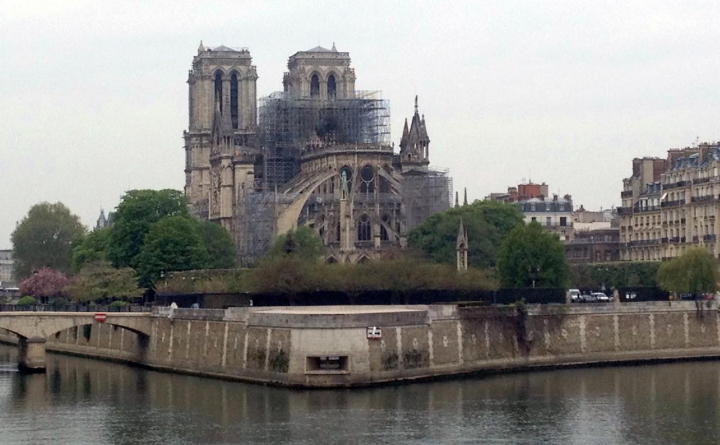 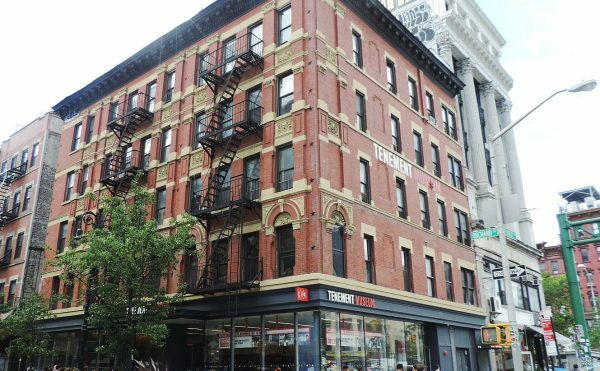 Paul Morozzo, a member of the campaign, told the Guardian that the activists all took precautions to not damage any of the statues, noting that the gestures are not permanent. 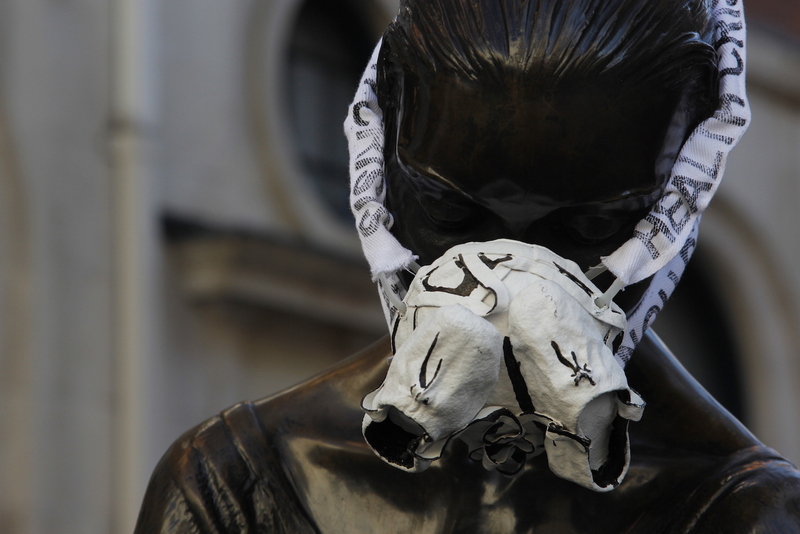 Since the arrests, city inspectors have been working to remove the masks. 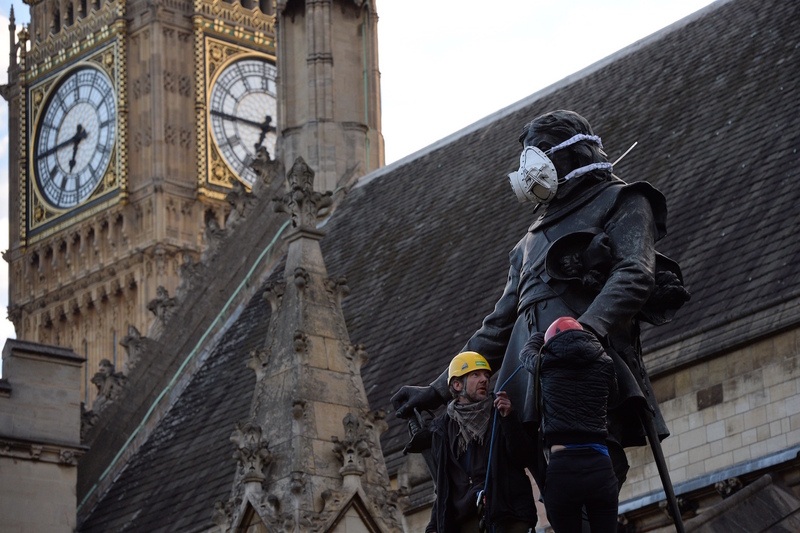 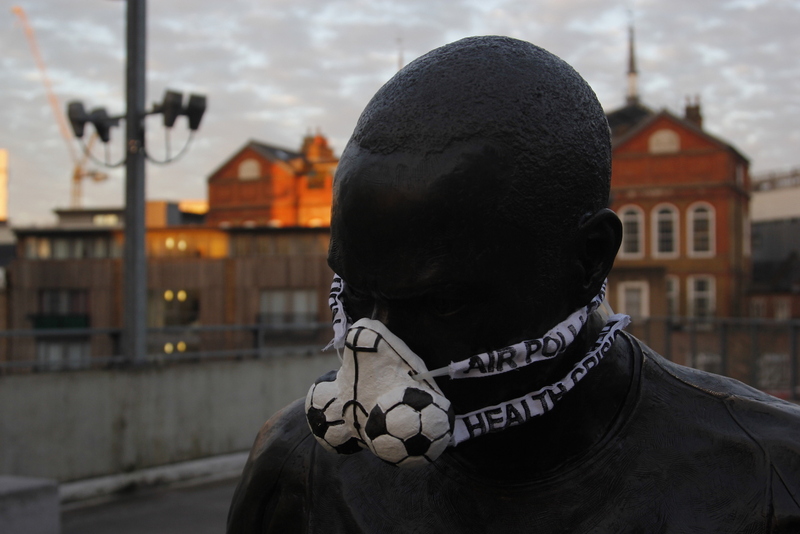 Although reminiscent of recent demonstrations in Colombia — which left the faces of Fernando Botero sculptures shielded behind fabric masks — the Greenpeace effort is the result of a month of planning to urge UK politicians to enact change in a city where nearly 9,500 people die prematurely from long-term exposure to air pollution. 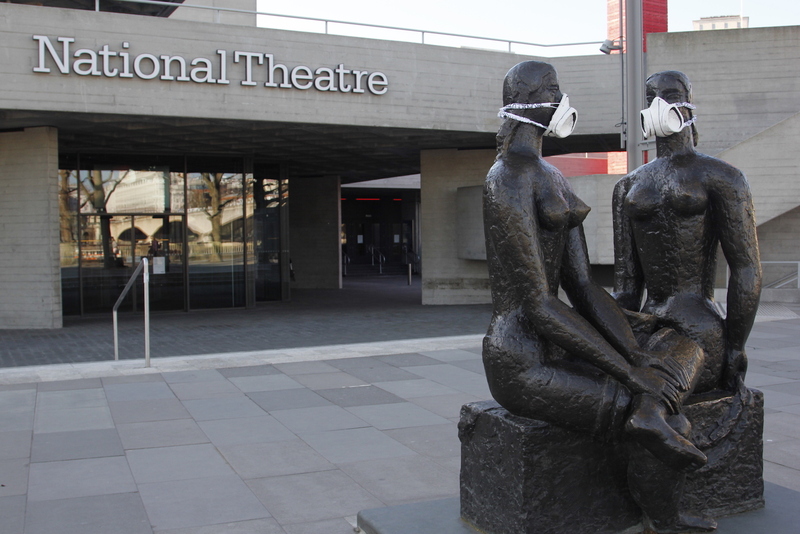 The Greenpeace protest is the most recent creative response to the city’s smog levels. 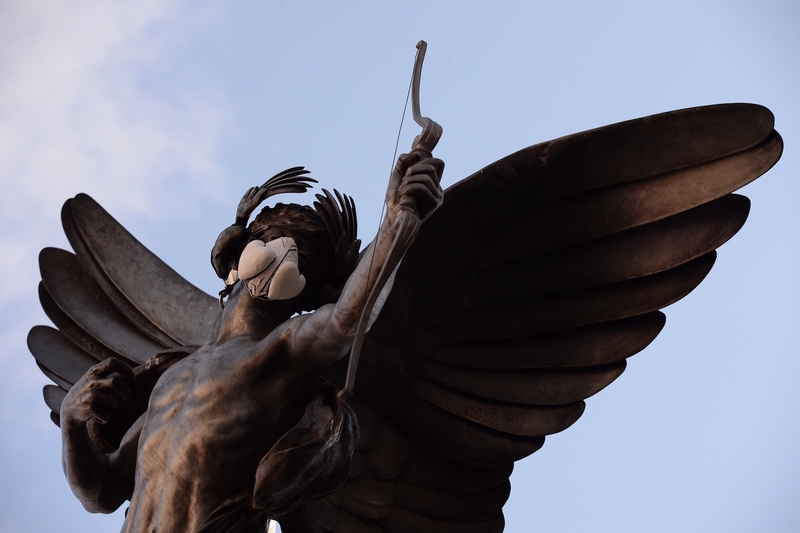 Last month, pigeons from the Pigeon Air Patrol flew across London to collect data on regional air pollution in another incredibly visible scene to stimulate public awareness of the issue and call for necessary legislative action.